Building Notes: Madge Lawson designed and made the windows. Margaret Cavanaugh helped choose the glass and coordinated the production and installation of the windows. Each window design was inspired by a spiritual concept. As the windows were structured into an overall pattern for the church, they began to represent for the artist a journey in spirituality. The windows in the back of the church begin the journey with the concepts of Forgiveness and Compassion. As these concepts are expressed and expanded, the journey continues with Peace and Wisdom, Hope and Joy, then Love and the inspiration of Spirit and finally spiritual Vision and a new understanding of Justice. As color suggests moods, the hues chosen for the windows begin with the cooler contemplative colors of purple and blue violet and proceed through blue, blue green to green. As the subject matter changes to the more joyful concepts, the warmer colors are introduced and predominate. Now we see red violet and red. The color palette ends with the most brilliant colors of red orange and gold in the windows near the front of the church. All the colors are displayed against a background of light amber glass which adds more natural light to the room. The colors chosen for the windows move through a rainbow of hues like the colors in a prism. Each window gives a hint of the colors to come next. The complementary of each predominating color is used somewhere in the window for contrast. As hearts and minds open to the goodness of God moving in ever more expanding ways in a person’s life, so the window designs suggest movement from the more easily recognized representational images at the back of the church to those which are more expansive and abstract at the front. 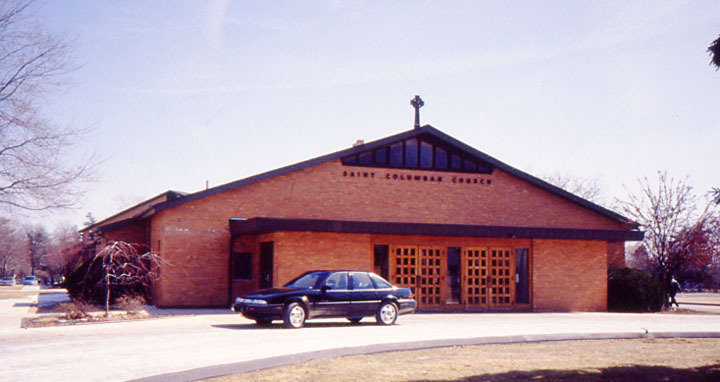 Rather than being named for individuals, the windows of St. Columban Church belong to everyone in the parish and are dedicated to their intentions. The journey suggested by the window designs is just one of many paths in spirituality. We hope, however, that its concepts will touch the hearts of the people of St. Columban parish and speak to their goodness.